Last year, Annabel was "the girl who has everything" — at least that's the part she played in the television commercial for Kopf's Department Store. This year, she's the girl who has nothing: no best friend because mean-but-exciting Sophie dropped her, no peace at home since her older sister became anorexic, and no one to sit with at lunch. Until she meets Owen Armstrong. Tall, dark, and music-obsessed, Owen is a reformed bad boy with a commitment to truth-telling. With Owen's help,maybe Annabel can face what happened the night she and Sophie stopped being friends. Just Listen was my first Sarah Dessen novel. I've been meaning to read her books for years and never got around to it until now. I can't believe I missed all this wonderfulness! How I adored Just Listen. Sarah Dessen is a genius of contemporary YA romance. Truth. You can whittle the theme of Just Listen down to that one word. The importance of being truthful to your friends and family. But most of all, the importance of being true to yourself. Annabel Greene lives a perfect lie. As a model and television commercial actress, she's beautiful, carefree, and full of smiles. In reality, Annabel is haunted - by a recent event, by her family's issues, and by her inability to stand up for herself. Enter cute boy stage right. Owen seems like a bad boy. Sullen, perpetually angry, and never without his headphones - Owen is not the boy you'd want to bring home to your parents. Except that he is...He is incredibly sweet, insightful, and honest. Most of all, honest. I loved how passionate Owen was about music and how eager he was to share his passion with Annabel. I loved how he accepted Annabel without hesitation, despite her status as a social leper and her lack of musical appreciation. I loved how he challenged Annabel to be the person she was meant to be. Owen is shining star in a crowded field of YA love interests. Another highlight of Just Listen is the family element. Books with strong family plot arcs are rare in YA. Annabel's parents and sisters were crucial characters in this story. Annabel's entire family lives a lie. They're falling apart but refusing to admit it. Only when Whitney's (Annabel's sister) eating disorder advances close to a point of no return are they even willing to acknowledge that there's a problem. From that point, we have a slow healing process throughout the book. I loved seeing how Whitney progressed in her recovery from her eating disorder. It felt real - neither too fast nor too slow. Dessen also did a great job of highlighting each family member's flaws and moved the plot in a way that allowed each person to improve. Just Listen is a delightful book. It has everything that I want in a contemporary YA novel. Romance of course. But also strong plot arcs that take the story beyond a simple romance. Family, friends, self-discovery. Everything in the story is cleaned up by the end in a way that could potentially happen. The book never felt fake. I will definitely be reading more by Sarah Dessen. I chuckled at "Enter cute boy stage right" and could imagine a scene. Thanks for sharing your thoughts about the book too. I love Sarah Dessen's books. They are all my favorites. Great review though. I've just reviewed Lock and Key by Sarah Dessen today. Thank you for sharing such an honest review on Just Listen by Sarah Dessen. Awesome. I just read this book not too long ago. I can't believe I hadn't rad them before either. My review of the same book posts next Wednesday, if you get a chance to stop by. This is my fave Sarah Dessen book. I love it. Glad you enjoyed the book. This sounds very sweet; great review! I really want to read this one now. Gotta love Sarah Dessen. Love her books. So glad you got a chance to read Sarah Dessen's books! Isn't she awesome? I got into her books quite late and am trying to work my way back to her earlier stuff. I've really loved all of her books that I've read: Dreamland, Just Listen, Along for the Ride, and What Happened to Goodbye. She's definitely on my auto-read list. This one sounds like a cute read. I haven't read any of Dessen's books, but I've only read rave reviews about them. *add to list* Thanks! This sounds like an interesting read. Thanks for sharing! I haven't read any of her books. I've been meaning to read one of her books. This one sounds interesting. Great review! This is still my favorite Sarah Dessen novel. Owen's view on things is pretty amazing. I really need to reread this book! Thanks for the review! Wow.. nice review! Makes me interested in Sara Dessen in general and this Just Listen in particular. Thx for sharing! Huh I've never read her books, the synopsis' jsut dont jump at me, but maybe ill take your word for it and try her out! they just sound... 'cute' ya know? I've been meaning to read a Dessen book forever as well they all sound really cute and she's been getting great reviews. Great review! This seems to be a good one to start with. This book makes me so many different kinds of happy! Owen and his honesty and the music angle and the wonderful story of a family trying not to fall apart. I'm glad you enjoyed it! 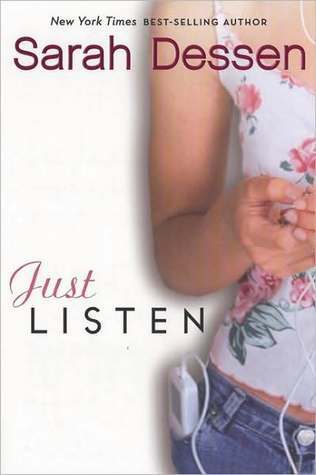 Just Listen was the first Sarah Dessen book I read too. Now, I've read all of her books except the newest one. I love them all. I've never read a Sarah Dessen book either. I'm not really big into contemporary books, but I like that her family is in the picture. Sounds like a great read! I might just make this one my first book by Dessen, too! I'm excited that you enjoyed your first taste of Dessen :D She's one of my absolute favourites. I've only read one other Dessen but I really enjoyed it. A cute and sweet romance. And, with this one, I liked the family element, too! Far too often, the families are just shoved off to the side or not present at all. LOVE Sarah Dessen which I why I was so excited to read this post! I haven't read this one though...I read Lock & Key which was very good. I'll check this one out. Yay! Another new Sarah Dessen fan. I love her work and Just Listen is one of my favourites :) I'm glad you enjoyed it. I read this one so long ago but I remember really enjoying it. It was very sweet. Sara Dessen has a way with this type of story. I have to admit I haven't yet read anything by Sarah Dessen, but I do like strong family arcs that are plot-relevant. Though I do have to wonder why a girl who's a model and TV actress is a social leper. In my high school, she would have been the Queen Bee, just because of her "fame." Ahh, so glad you enjoyed it!! I'm a total Sarah Dessen fangirl, so I get really excited when I see people discovering her books for the first time and enjoying them as well. I'm ashamed to say that I've yet to read anything by Sarah Dessen! Glad you liked her on your first try. I think the aspect that I would like most about this novel is the strong family element you mentioned. It really is lacking in a lot of YA! My first Dessen was Along for the Ride and I wasn't blown away so I haven't read anything else by her. But yes, a strong family unit is a rare find in YA, so now I'm really looking forward to checking JL out just for that.